Well… The second end of that back-to-back didn’t go as planned for the Devils from New Jersey. The team showed up for about 2 minutes and gave fans flashbacks to the game against the Tampa Bay Lightning a week prior. But this time, it wasn’t one of the best teams in the Eastern Conference dropping a touchdown on the Devils. It was one of the bottom NHL teams beating up on New Jersey. A promising start saw the Devils jump out to an early 2-0 lead in the first period. The Senators would then score six unanswered goals. Each team would pot one more goal before the end of the game as the final score was 7-3 in favor of the home Ottawa Senators which was not the result the organization was expecting after defeating Pittsburgh 5-1 the night before. 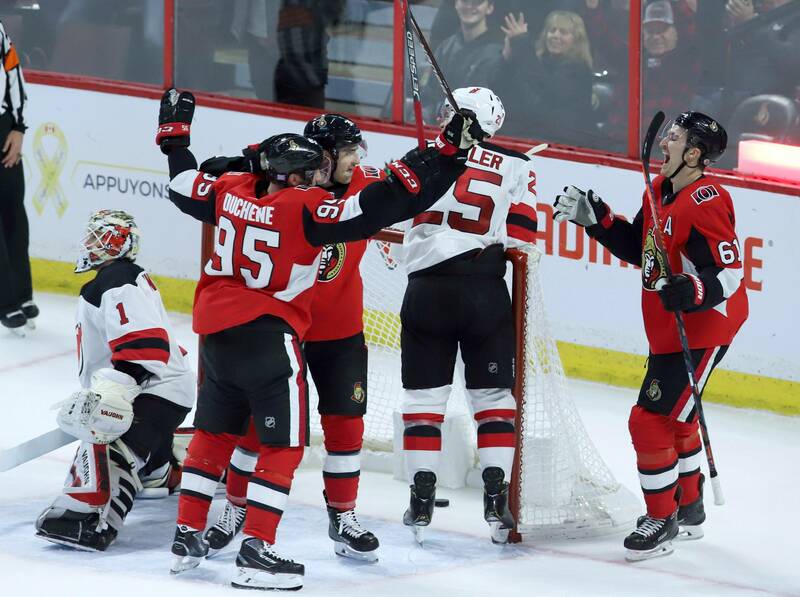 Here are four takeaways from the shellacking against Ottawa. The Devils have started off this 7 game road trip with one win and four losses. This wasn’t something fans expected especially seeing Detroit and Ottawa on the schedule. The road warrior team from last year hasn’t shown themselves this year, yet. But, there are some positives. This being one of them. They scored 2 goals in the first period against Ottawa. This is the same hot start we saw against Tampa Bay and Pittsburgh. This is a good sign that the Devils can jump out early on the road. We will get to being able to hold the lead later. The defense that was able to shut down the top scorers of Pittsburgh were not there the next night. From screening your own goaltender to the inability to clear your zone, there have been some glaring issues with this team. The defense, as of late, looks like it is a step slow. They might still be one strong defensive piece away from having a really good defense. Sami Vatanen is holding his role as Damon Severson and Will Butcher are developing. Yes, there are growing pains but those can be expected as the two young players on the back end hope to be top 4 defensemen in New Jersey. We got to see some of Cory Schneider and Keith Kinkaid on Tuesday Night. Cory allowed the first 4 goals but I only put 2 on him because of the defense’s inability to function correctly. Turnovers in your own zone and being unable to move opposing players from in front of your net usually spells a few goals for the opposition. Keith came in allowed two more goals before the Devils surrendered an empty net goal late in the 3rd period. I have been a fan of Cory Schneider since he got to New Jersey. I was hoping when he came back from his conditioning stint in Binghamton that he would return to the form we saw for the first half of last season. That Cory Schneider has not shown himself yet but we must allow him at some point to get into a groove. But, will Keith Kinkaid allow that? I believe Kinkaid should get the next start against Toronto on Friday. Now, no goalie is truly a “hot goalie” anymore and we must pick one at some point to lean on. Keith has been the horse early in the season and should start Friday but I believe that Cory will take back the reigns as starting goaltender by the turn of the new year. I have been very impressed with the play of Brett Seney and Joey Anderson over the first few games of their young NHL careers. They haven’t shown up on the score sheet that much. In fact, only Joey Anderson has a point between the two when he registered an assist against Pittsburgh on Monday. They are making the right plays and giving themselves scoring chances. That’s more than I can say about prior roster bubble players such as John Quenneville. There is one more Binghamton piece on the NHL roster I am curious about. That is defenseman Egor Yakovlev. In seven games in Binghamton he registered seven points. They were all assists. He might provide a much needed spark if put into the lineup and I am all for giving him a chance. He showed his loyalty to the franchise when he could’ve returned to Russia after being sent down to Binghamton after training camp. Yakovlev wants to prove he can be a defenseman in the National Hockey League. It is time to give him that chance. Who knows? He could be that missing defensive piece the team is searching for.